Internet Cafe Software, Cyber Cafe Hardware, Kiosk, Self Service, Coin Op, Bill Operated • View topic - AH5's muiti coin acceptor AC5 reprogram manual. It include the powerful electronic micro-controller, (like a small computer system) the AC5 can automatically identify the coin by material, thickness and diameter. Programming the type of coin by training, when AC5 is in programming mode it memorize the data of material, thickness and diameter of the coins. When AC5 is in working mode it will recognize the coins by a complicated calculation and process these memorize data. 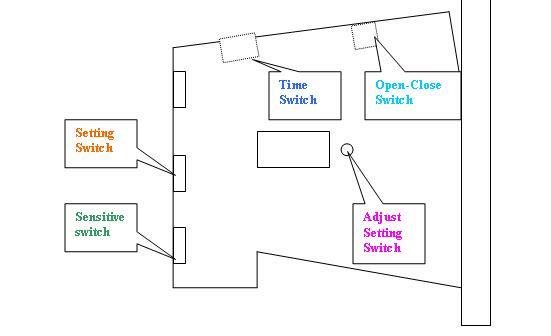 There is a switch in the AC5 can adjust the accurate degree of recognizing sensitive. The AC5 has software guard system; this guard system has alarm, which prevents opportunistic behaviors. o	When the Sensitive Switch also switch to NOM, ”00-99” means how many times of the output pulse signal will be sent when the programmed coin was deposited,. “01” means this group may output 1pulse. 	To get the optimal effect, Please turn on power about 10 minutes before using or setting. 	To get the optimal effect, Please turn on power about 10 minutes before using or setting . 7. Press the Adjust Setting Switch to adjust the coin value in turn and let the LED display the value, which want to erase. 18. Deposit the coins in turn, can program up to 10 coins .If less than 10 coins can add and store later. For example can prepare 10 quarters as different condition as possible. Or can deposit 10 same or different tokens. 19. Repeat above two steps to set other coin group values. 1. Clear all the settings. follow steps 4.1 and 4.3 to erase previous settings. 2. Prepare 10 Canadian Quarters, 10 Loonies, 10 Toonies. 5.	press Adjust Setting Switch once, LED will show “01”, drop the 10 quarters in sequence, when you drop the 10th quarter, LED will show “F” means the setting is done. ( if pressed more times, for example the display show “01” or “02”, first turn the Setting Switch to START, then turn Setting Switch to SET again LED will show “00”). 6. Press Adjust Setting Switch 3 times until LED shown “04”, drop the 10 Loonies in sequence, when drop the 10th quarter, LED will show “F” means the setting is done. 7. Press Adjust Setting Switch 4 times until LED shown “08”, drop 10 Toonies in sequence, when drop the 10th quarter, LED will show “F” means the setting is done. 8. Turn Setting Switch to START, then AC5 is ready to use. Example B : Setup for Canadian Nickel(0.05), Dime (0.10), Quarter(0.25), Loony($1.00), Toony ($2.00) output pulse only up to 0.25. 1. Clear all the settings. Following steps 4.1 and 4.3 to erase previous settings. 2. Prepare 10 Nickels, 10 Dimes, 10 Canadian Quarters, 10 Loonies, 10 Toonies. 8. Press Adjust Setting Switch 15 times until LED show “20”, drop the 10 Loonies in sequence, when drop the 10th quarter, LED will show “F” means the setting is done. 9. Press Adjust Setting Switch 20 times until LED show “40”, drop the 10 Toonies in sequence, when drop the 10th quarter, the LED will show “F” means the setting is done. 12. Turn Setting Switch to START, then AC5 is ready to use. 1. When drop 1 quarter, it will output one pulse signal, drop 1 Loony it will output 4 pulse signal, drop 1 Toony it will output 8 pulse signal, and only when drop 5 nickels = 1 dime and 3 nickels = 2 dimes and 1 nickles >= 0.25 then it will output 1 pulse signal. 6. Turn Setting Switch to START, then AC5 is ready to use. Example D : Setup for US$ Nickel(0.05), Dime (0.10), Quarter(0.25), output 1 pulse only up to 0.25. 10. Turn Setting Switch to START, then AC5 is ready to use. 11. When drop 1 quarter, it will output one pulse signal, and only when drop 5 nickels = 1 dime and 3 nickels = 2 dimes and 1 nickels >= 0.25 then it will output 1 pulse signal. 1. Clear all the settings. Following the 2.4.1 and 2.4.3 to erase previous settings. 9. When drop Euro50cent, it will output one pulse signal, drop Euro1 it will output 2 pulse signals, drop 1 Euro2 it will output 4 pulse signals. 10. When set the 15minutes/ per credit pulse on the Self Service Server PC then you will got Euro50cent for 15 minutes, Euro1 for 30 minutes, Euro2 for 60 minutes.